She charmed America with her smart, likable, down-to-earth personality as she campaigned for her husband, then vice presidential candidate John Edwards. She inspired millions as she valiantly fought advanced breast cancer after being diagnosed only days before the 2004 election. She touched hundreds of similarly grieving families when her own son, Wade, died tragically at age sixteen in 1996. Now she shares her experiences in Saving Graces, an incandescent memoir of Edwards's trials, tragedies, and triumphs, and of how various communities celebrated her joys and lent her steady strength and quiet hope in darker times. Edwards writes about growing up in a military family, where she learned how to make friends easily in dozens of new schools and neighborhoods around the world and came to appreciate the unstinting help and comfort naval families shared. 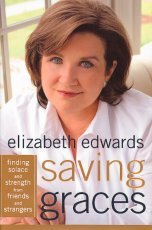 Edwards's reminiscences of her years as a mother focus on the support she and other parents offered one another, from everyday favors to the ultimate test of her own community's strength -- their compassionate response to the death of the Edwardses' teenage son, Wade, in 1996. Her descriptions of her husband's campaigns for Senate, president, and vice president offer a fascinating perspective on the groups, great and small, that sustain our democracy. Her fight with breast cancer, which stirred an outpouring of support from women across the country, has once again affirmed Edwards's belief in the power of community to make our lives better and richer.